There was sunshine and there was rain. There was music and merriment. There was agitating and organising. And once again Merthyr Rising was a big hit with music lovers and trade unionists from Merthyr Tydfil, Wales and beyond. 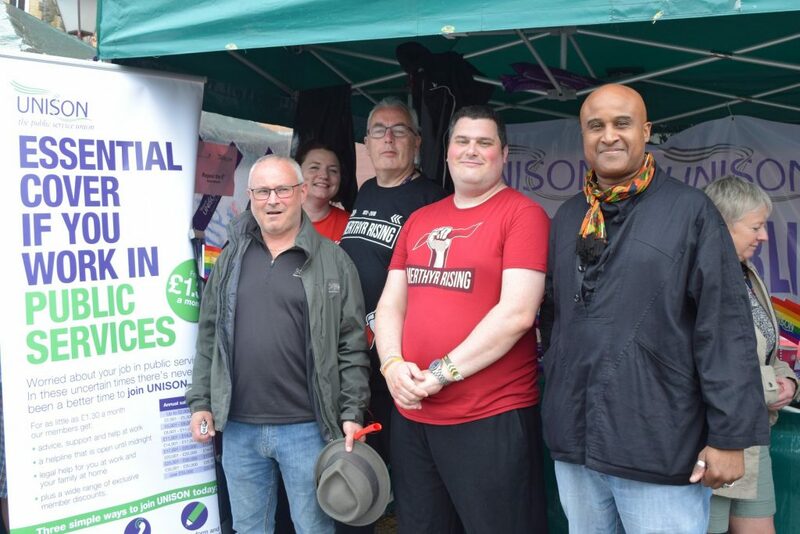 For the third year running UNISON took the role of lead partner for the Merthyr Rising festival, an event marking the anniversary of the 1831 workers uprising, which saw the red flag flown as a sign of protest for the first time anywhere in the world. This year the event attracted visitors from all over the UK and even America and Australia. The weather was unpredictable, but rain did not stop anyone enjoying the festivities, they merely grabbed a UNISON poncho off our stall and carried on regardless. 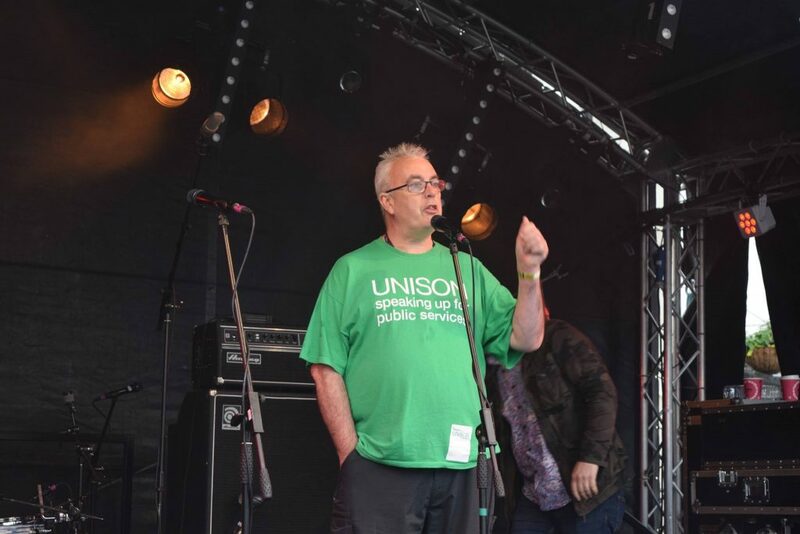 The event formally kicked off on Friday evening with a speech from UNISON Regional Convenor Peter Crews, followed by Cardiff’s Afrocluster and the mighty Dreadzone. 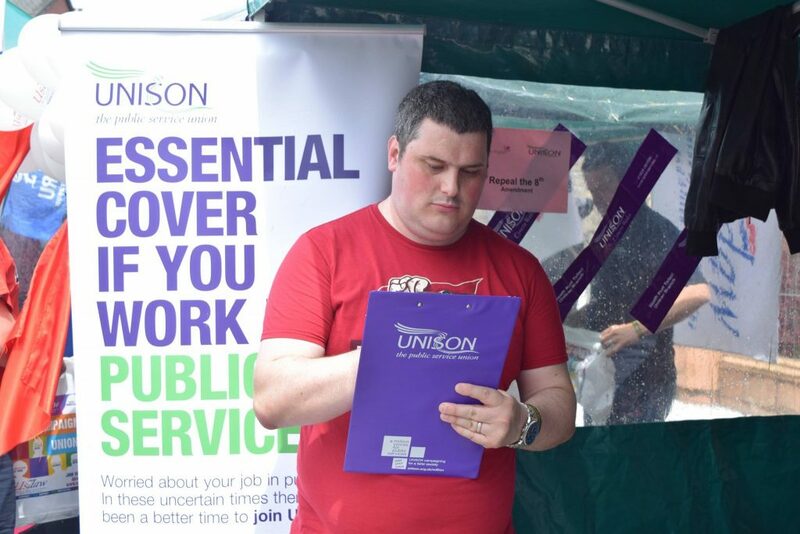 A stormy Saturday morning turned into a gloriously sunny Saturday afternoon and a busy day on the UNISON stall. Hundreds of visitors signed our joint petition with the GMB and Unite against cuts to breakfast clubs for children in Merthyr Tydfil. 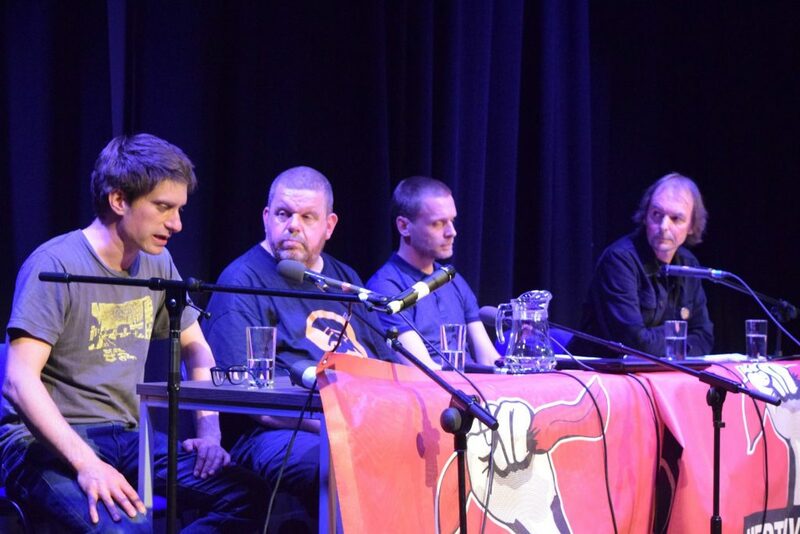 In the red house debates included two hosted by our branch communications officer Terry Evans, one on the use of undercover police to spy on activists, including trade unions, and one on the power of music to influence social change. debate on the power of music to influence social change. 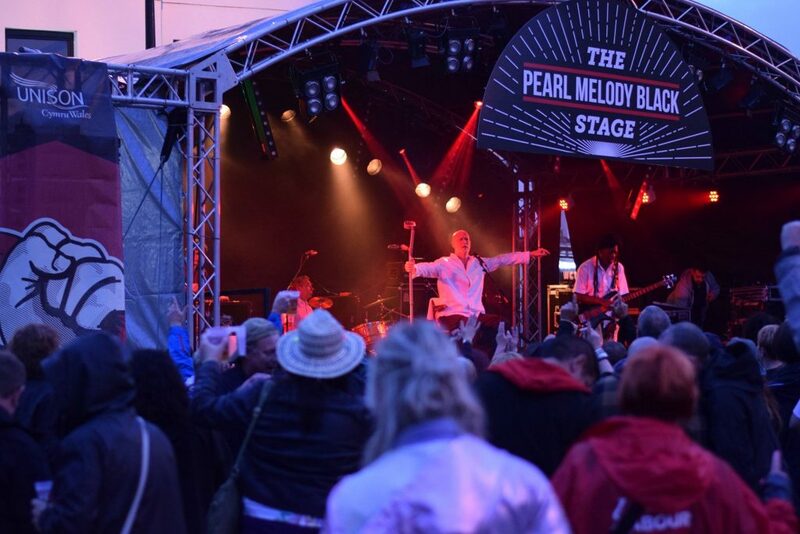 Saturday night’s entertainment included Captain Ska, Ruts DC and Roland Gift. 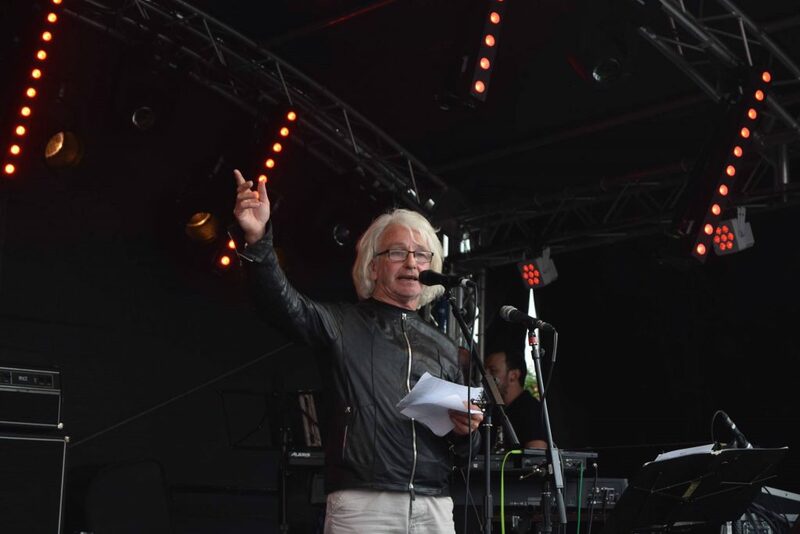 In between bands Branch Assistant Secretary Michael Crimmings took to the stage to announce the repeal of anti-abortion legislation in Ireland following a historic referendum; before introducing eighties legend Rusty Egan who DJ’d from the balcony of the Red House. 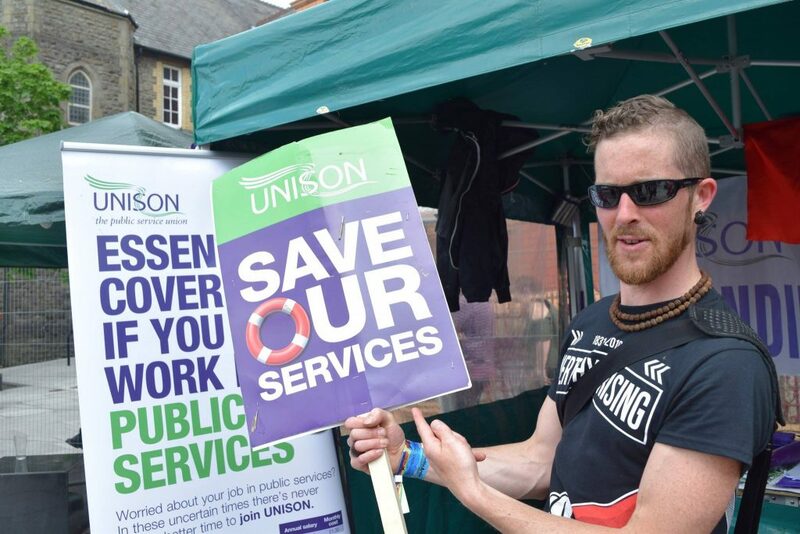 Sunday kicked off with the traditional trade union march through the town, culminating in a rally in the red House, including a rousing speech from UNISON Assistant General Secretary Roger McKenzie. The inclusion of a second stage this year added a new dimension to the festival. With beans on Toast and local boy Larry Love of the Alabama Three among the delights on offer on Sunday. 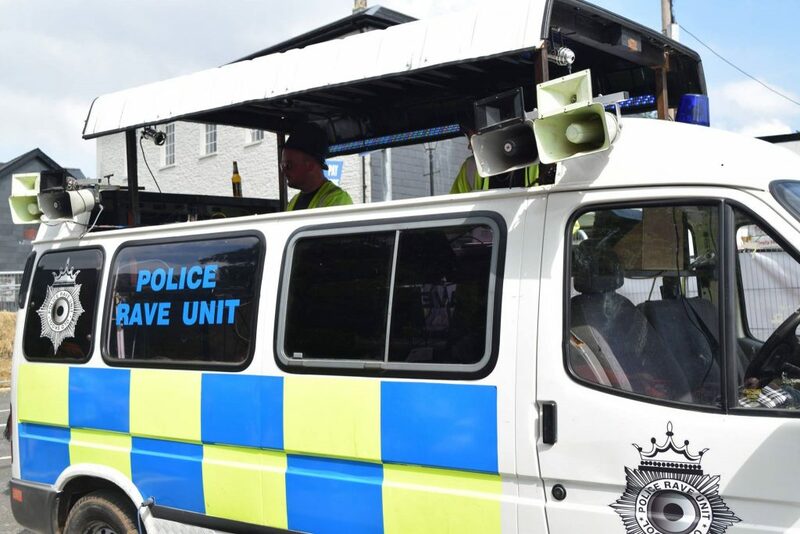 Slightly less spectacular than Rusty Egan, but equally entertaining, the Police Rave Unit van kept the masses grooving into the afternoon. Up and coming metal hip hop crossover band Regime stole the show on the main stage on the Sunday afternoon; before calling around to the UNISON stall to sign our petition and pose for some photographs. 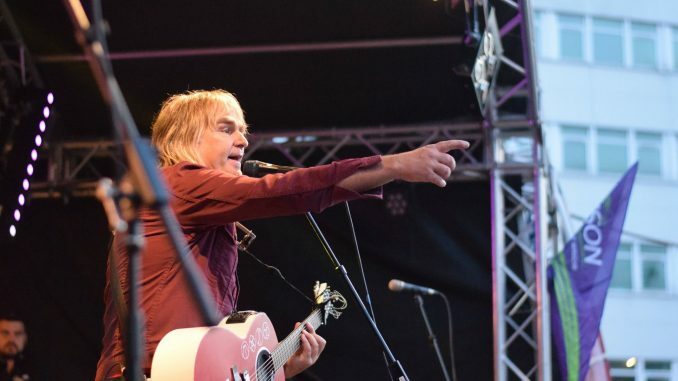 The Blockheads, dragged out all their classics for their show in the evening, before Welsh folk heroes the Alarm brought the weekend to an appropriate close, in front of a sea of red flags being waived by a satisfied and exhausted crowd. 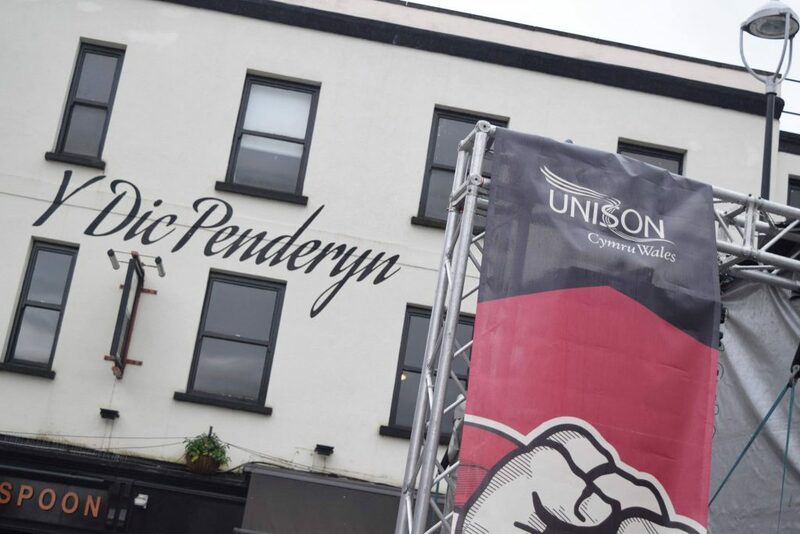 UNISON Regional Convenor Peter Crews stated: “The Alarm may have sung about the spirit of 76 in their set, but in Merthyr, the spirit of 1831 is alive and well. The rising continues”.